A divorce is a life changing decision made when a marriage has fallen apart. When a couple has children, it can be a million times more complicated. If they are very young, they may not understand why one parent has moved out and is suddenly not in the picture on a daily basis. If they are a bit older, they may feel that the situation is their fault. It is important that you handle these circumstances carefully in order to make it as easy as possible for your children to adjust to live after a divorce. The first thing you want to do is sit down and discuss the situation with your children. It is best for both parents to be present during this conversation. This allows your kids to see that there are no hard feelings between the two of you, and that life will be okay with one parent living elsewhere. Explain that the decision was made between you and the other parent, and that the children had nothing to do with it. Leave out any negative information, and avoid pointing fingers or arguing with your ex-spouse in front of the children. 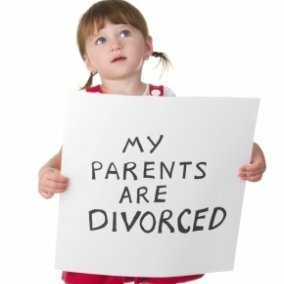 During this conversation, you must also make the children understand that the divorce was not their fault. Children may not see the bad things going on in their parent’s relationship, so they naturally assume that they are the cause for the separation. They think if they had behaved better that their parents would still be together. You must not let them take the blame. They need to know that they were not even a slight part of the reason that you and your ex have decided to end the marriage. Since child custody arrangements will need to be made, you will need to keep your relationship with your ex-spouse civilized. This is not just for your children’s sake, but it will also make things run smoothly in the situation of visitation, holidays, and other situations that arise regarding the custody the two of you share. Your children should never see the two of you argue, call each other names, or anything else that could make them feel bad. Also, avoid making your children the messengers between you and your ex-spouse. Competition between parents is very unhealthy, for both the adults and the children. Trying to be your children’s favorite will do nothing for you in the long run. All it will do is tear your children apart. There will be a great deal of stress placed on the kids if they are forced to choose their favorite parent. This is completely unnecessary, and no child should have to be faced with such a decision. Be kind to yourself, beating yourself up serves no one and your children are watching. Ask for help when you need it. Being a single parent is not easy, therefore rely on friends and family to help you when you need it. Make sure that you take some time for your own self care because this is important. Divorce is an emotional roller coaster for you and your children and they need you to try to be the nest you can be for them.